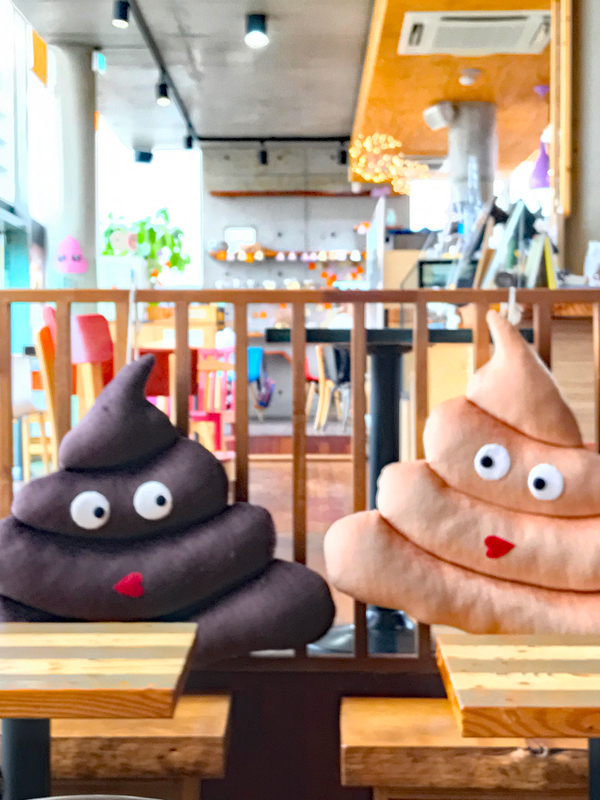 This week we’re heading to Seoul’s Poop Cafe (also known as Ddo-dong Cafe). Yes, you read that right. 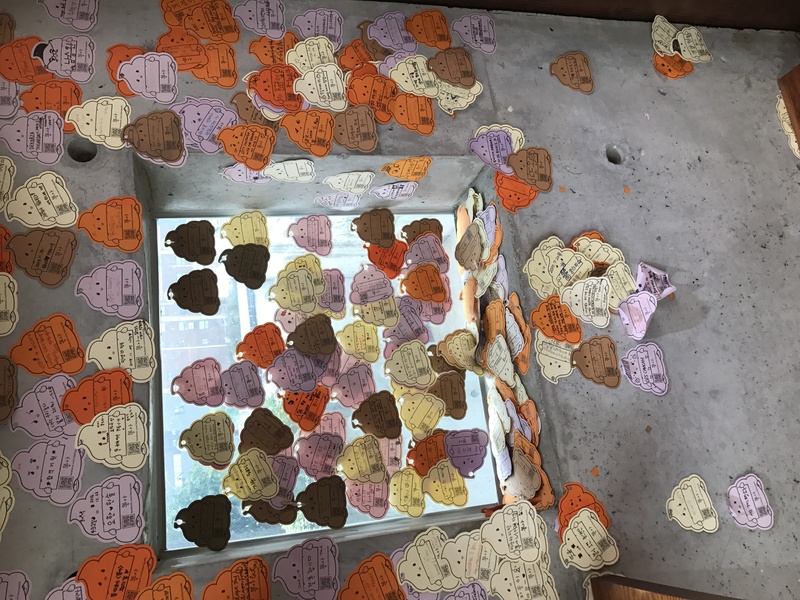 Believe it or not, Seoul is not the only city with a poop-themed cafe. 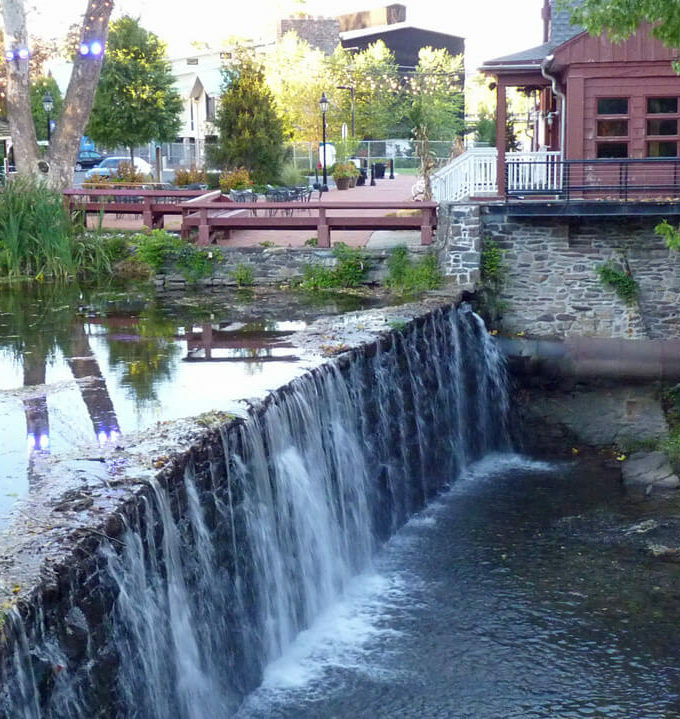 Canada’s largest city, Toronto, also boasts this dubious distinction. 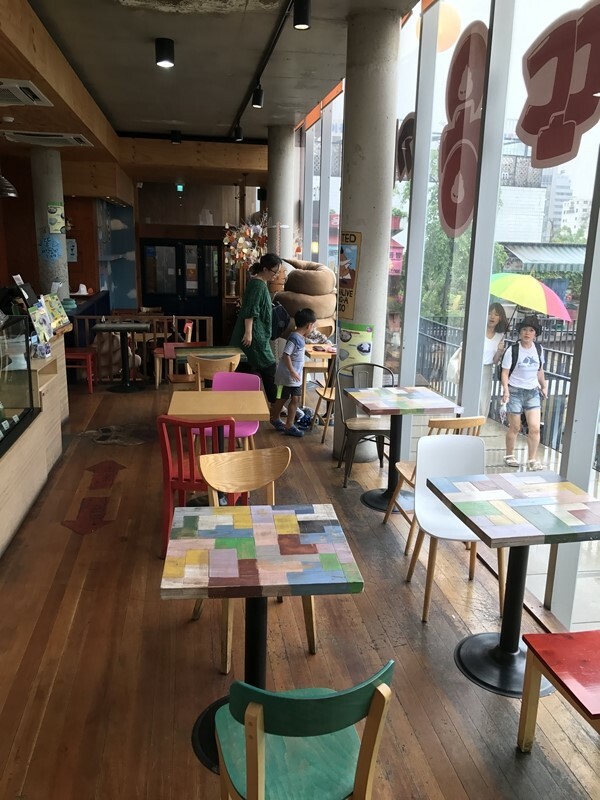 However, the Seoul Poop Cafe, which opened in 2015 is the original. 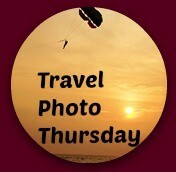 Welcome to week 338 (7/27/2017) of Travel Photo Thursday. 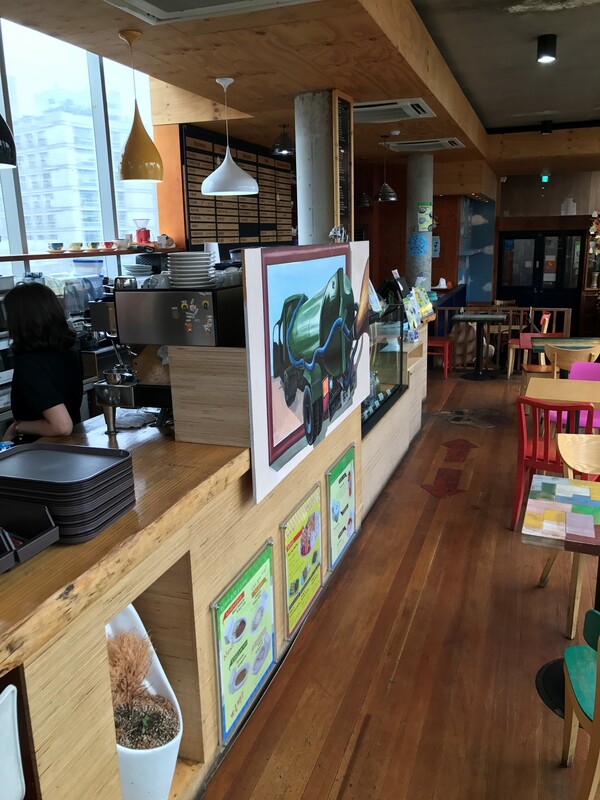 The cafe is located on the top floor of Insadong’s Ssamzie-Gil Building, which is about a three-minute walk from the Anguk Subway Station. Come out exit 6, head straight and you’ll see the Information Center. Hang a left and you are on Insadong’s main drag. Walk 1-minute and you’ll see the SSamzie-Gil Building on the left. 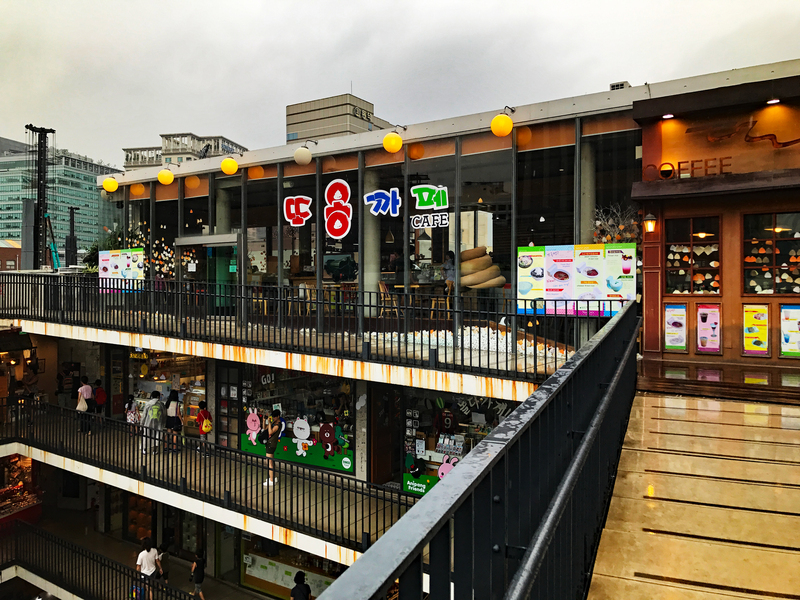 The mall is full of cute shops, so it may take you a while to get to the Poop Cafe, should you decide to browse along the way. You can build up a thirst along the way! The coffee shop wasn’t too crowded when I arrived, but there was a steady stream of customers, made up of mostly teenagers and moms with young kids. Nothing really stands out when you enter. Although, if you look down to the right you’ll see a plush turd. There are quite a few of these scattered around the cafe. Most of them are smaller, and it seems that perhaps little kids and big kids like to play with them. Small plush turds are also offered for sale. Anyone for a pet turd? When I got to the Poop Cafe counter I did notice photos advertising food served in squat toilets. If you look down, you’ll see the plant holder urinal. I think that’s a cute idea. The cafe also makes and sells turd shaped bread and scones, but they were sold-out. 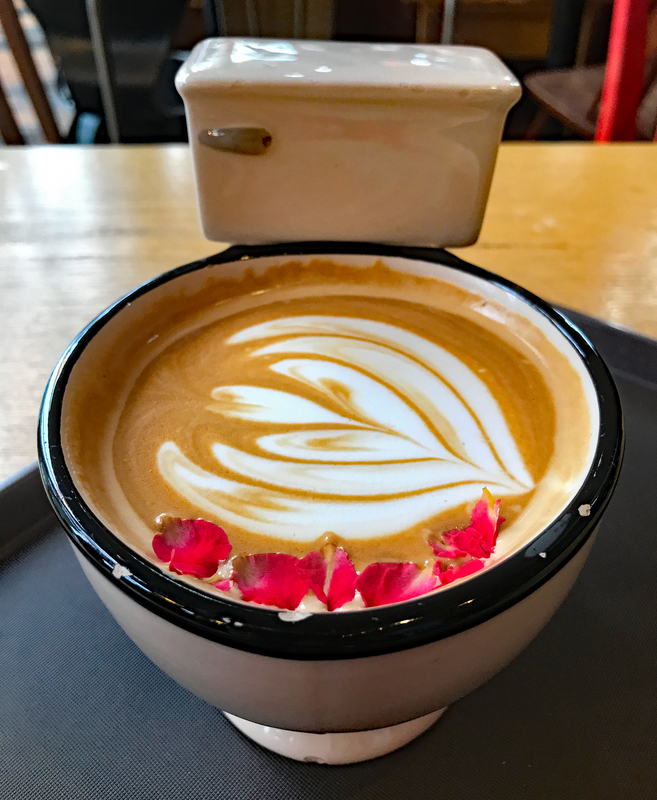 I chose a hot rose latte served up in a mini toilet. I can’t say I was impressed with the chipped paint around the toilet bowl. Maybe the Poop Cafe is going into the crapper?  The coffee was just okay, nothing memorable. While I waited, I got to spend some time with these two cute turds. So, are you wondering why Korean’s seem to be fascinated/obsessed with poop? After all, this isn’t the first Korean poop-themed post I’ve written. Do you remember the Toilet Museum? I’ve done a bit of research and it seems here in Korea poop symbolizes good luck and fortune. Dreaming about poop or going to the bathroom is a sign that something good is about to happen. The Poop Cafe is open daily from 10:30 am to 9:00 pm. I was there early afternoon and it wasn’t busy. Would I recommend this as a must-see in Seoul? Um, probably not. However, if you’re around Insadong, why not? It’s something you can laugh about with friends and family back home. Have you been to the Poop Cafe in Seoul, or Toronto? Have you ever had the urge (no pun intended) to drink your morning coffee from a mini toilet masquerading as a coffee cup? Let us know in the comments. Darn! I forgot we had one in Toronto. I will check it out. And no, that coffee is not appealing. Hi, Jackie. Let us know about the Poop Cafe in Toronto. I hope they serve better coffee! Flushed with embarrassment reading about the Poop Cafe! (Sorry, couldn’t resist!) It seems to me they should open a branch at the Toilet Museum. Their turds even look just like the mascot of the Toilet Museum, called Toile! Ewww! No I’m not drinking from a toilet mug. Intersting but not my thing. Hi, Carol. I understand completely!There is something very off-putting about drinking out of anything resembling a toilet. Strange strange!! I think this cafe could put me off my coffee and food for that matter. I’m not at all into poop! Haha, Kathy! I hear you loud and clear. I didn’t find my coffee to be particularly appealing and there was no way I was eating anything out of dish shaped like a toilet! Hi, Jill. This was a one time visit for me. The animal cafes are more to my liking, too. I needed a poop post after a day of sorting and discarding. I am sure you’ll agree that while change may be good for the soul it can be rather taxing on the mind and body! Thanks for a chuckle. Haha, Jackie. My pleasure. I think I have aged 10 years during this move. Hopefully, the Nova Scotia clean air will refund those years! Hi, Ruth. Chocolate ice cream on a poop themed plate would not excite me. Oh wow..truly weird and interesting. My kids would get a kick out of this and I’m sure would want to visit if we ever make it to Seoul or Toronto. Not sure if I could drink out of that toilet cup. Hi, Mary. I am sure your kids would get a charge out of this place. I would love to see how the Toronto Poop Cafe compares to the Seoul location. Drinking out of that toilet cup is not something I want to do again anytime soon. I can see the attraction – but no! Do you think there are a lot of Koreans in Toronto? Hi, Jan. I don’t know if Toronto has a large Korean population or not. I know they have one of the largest Chinese populations in North America. It would not surprise me if they do have a large Korean community. Korean’s are usually attracted to large centers. I have heard South Korea is kind of into their toilets and poops. Surprised to see this in Canada! Hahaha, no I’ve never been a poop cafe. But it does look like a cute place that I bet the kiddos would think was fun. Looks like a great place to eat while in Toronto. It was a fun and great idea for a Cafe. I’ll definitely go here one day with my family. While my three boys would get a huge kick out of this place, I can’t say I would be too excited to drink my Chai Latte from a toilet bowl….. While I don’t think I could ever eat there I am sure my kids would find it funny. It’s too out there for me. Hahahaha.. I’ve never heard of such a concept. It’s kinda bizarre but interesting and innovative. It looks like a must visit place for fun. Hi Shally. It is bizarre, but yeah if you’re in Seoul with a bit of time on your hands it’s worth a visit. I had seen this on some travel channel too. Sometimes weird is good, but I think this weird would simply make me queasy. That is such a pretty place to visit and the coffee looks really delicious. Aside from that I love their name it’s really catchy. A hot rose latte? Yum. Served in a toilet? bahahahhahahah  My kids would love that place! I don’t know if I’ll ever get the chance to go to Seoul but if I do I’ll keep this cafe in mind. Thanks for the tip! I would love to visit here someday! I think my boys would have a blast. I am not tempted to visit a good joint dressed as “everything poop.” The concept is super funny, though. Oh em gee! My kids would love to go to a place like this. Do you have the option to purchase the little toilet mugs? I know some places let you buy your beverage cups when they are funky like these.